Today morning NG futures opened with slight strength but fell later in the day breaking support, trading at 185 and under. Investors and traders were waiting for EIA report and based on the estimates we could have expected some rally this week. Prices today indicated short-sellers are in control and there was no concern of weather or storage. Looking at the situation, we could have an issue of less demand due to mild weather conditions. There was an indication of largest storage withdrawal this winter. Bloomberg was predicting a withdrawal range of 222 Bcf to 253 Bcf, with a median of 247 Bcf. Bespoke Weather Services projected a 253 Bcf withdrawal. EBW expected to see a 245 Bcf draw. Reuters was looking for a withdrawal of 228 Bcf. Report released today - Working gas in storage was 1,960 Bcf as of Friday, February 1, 2019, according to EIA estimates. This represents a net decrease of 237 Bcf from the previous week. Stocks were 135 Bcf less than last year at this time and 415 Bcf below the five-year average of 2,375 Bcf. At 1,960 Bcf, total working gas is within the five-year historical range. The withdrawals were less than expected and as stated earlier NG supply for abundant. Looking at the EIA report and market trend, I don’t see a big rally since bullish time of NG is far gone. There could be a short rally, a profit-booking rally. There is massive support around 185-183 levels so I would not advise selling at this point. One should wait for a short rally in upcoming sessions since we are in an oversold position. I am not expecting a strong buy and would recommend sell on rise strategy for upcoming sessions. 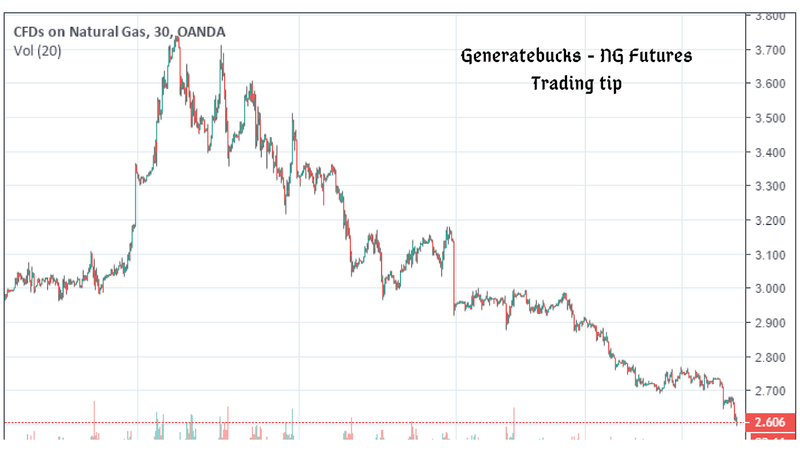 Trading tip – Sell NG futures around 189 (add more till 195) for positional target of 175 with stop loss of 210. Enter only on rallies.